Gardens in Karesansui style, which is a dried type of garden, is something that shows the Japanese sense of beauty treasuring quiet simplicity and subdued refinement called “wabi-sabi“. It is popular for its quiet beauty. However, the popularity of gardens in Karesansui style is rising even more recently, and the launch of a game creating Karesansui is creating a buzz. We will introduce the history and the recent boom of Karesansui here. Karesansui is a style of Japanese gardening, expressing landscape with just stones and sands, and without using water. Before Karesansui, people needed to get a source of water and make a stream to pipe water to make a garden. However, after Karesansui was spread, it became possible to create gardens in places where water source isn’t available. Generally, in Karesansui, white sand is used to express the surface of water and the stones displayed here and there represents mountains. There are no ponds or streams using real water. On the white sand, there are small lines called “Houkime”, and they represent the flow and ripples of water. Also, even though there is no water, there are places that have bridges, and it is especially emphasized that there are water there. This ripple expressed in sand will disappear if they are left the way they are, so it is drawn by an ascetic monk every 7~10 days. Since its aim is to portray water and mountains, materials other than white sand is used. 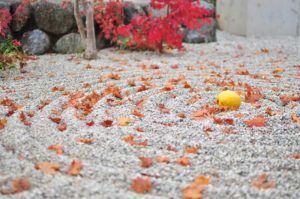 Gardens using red sand or gardens made only with stones are also called Karesansui. 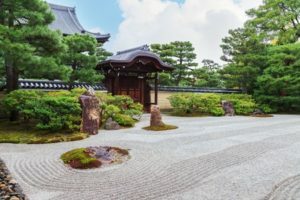 It can be seen often in temples of Zen Buddhism, which descended from Mahayana Buddhism, and gardens in Karesansui style spread along with Zen. In Zen Buddhism, which does not involve flashiness and gorgeousness, people gazed at Karesansui from the parlor. It is said that they also used it for meditation and zazen (sitting meditation). It was in “Sakuteiki (The record of making gardens)”, a writing that was published in the Heian period, that the word Karesansui was first used as a technical term for creating gardens. Before that, when speaking of gardens, Chisen garden (pond garden) was the most common. It is a style of making a view with natural mountains and water artificially in the garden. At first, Karesansui was a part of this Chisen garden, and was made as a section of it. However, when creating gardens in places where it is difficult to pipe water such as the surface of the mountain or where the usable area is limited, Karesansui was used because of its capability of expressing water with something else. In Muromachi period, along with the spread of Zen Buddhism, people were required to understand the world of Karesansui not only with what they saw with eyes, but also spiritually, since it was simple and was high in abstractness. The expressions in Karesansui are very abstract, and they form a quiet, beautiful world with simple materials such as stones and sand. The beauty sense of Japanese people towards nature is also expressed there. The number of stones used in Karesansui is usually 15, but sometimes 7 are used. In a traditional thought of China, odd numbers were called “Yousu (active numbers)” and were thought to have good luck. We still have a ceremony going to a shrine and wishng for the children’s growth called “Shichi go san (seven five three)”. In this ceremony, boys are cerebrated in their 3rd and 5th year and girls are cerebrated in their 3rd and 7th year. 7 and 15 are both odd numbers, but as for 15, it is a number adding 7,5, and 3 altogether, so it is a number showing luck and completeness. Getting influence from these thoughts, it is said that the number of stones used in Karesansui is usually 15 or 7. Karesansui has a deep connection with the spread of Zen Buddhism and the cultures of Muromachi period, so most temples are in Kyoto, where those cultures were born. Here, we will introduce some beautiful Karesansui style gardens in Kyoto. Ryoanji is a temple made by Katsumoto Hosokawa in Muromachi period, and it is registered as a UNESCO world heritage. Its biggest highlight is its Karesansui style garden. It is a garden representing Japan, so many tourists from in and out of the country come for a visit. 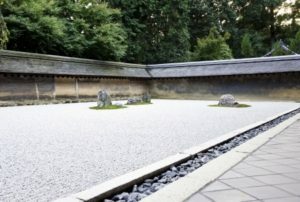 The size of the garden is 22 meters in width and 10 meters in depth, and 15 large and small stones are placed in white sand. These 15 stones are placed so that no matter where you look from, one stone will hide behind another and it seems like there are only 14 stones. In the orient, the number 15 is said to mean something perfect, but with human eyes, only 14 can be seen at a time, so it is said that this carries a message that you have to see the 15th one with your heart. Kenninji is the oldest Zen Buddhism temple in Kyoto, and it is made in Kamakura period. It is also famous for the various artworks, including “Fujin Raijin zu byobu (The folding screens of tbe Wind God and the Thunder God)” by Sotatsu Tawaraya. Its garden, named Daiouen, is 30 meters in width and is 15 meters in depth, so it is very spacious and you can feel the openness. Also, there is a garden called Maru Sankaku Shikaku no Niwa (Garden of Circle, Triangle and Square). As can be seen from its name, it is a unique garden where you can see circles, triangles, and squares. ※Maru Sankaku Shikaku no Niwa (Garden of Circle, Triangle and Square): It is said that the six major thoughts of Buddhist Tantrism are represented with earth (square), water (circle), and fire (triangle). A board game of Karesansui? This may be a little off track, but recently, in Japan, a board game of making Karesansui style is creating a buzz, starting from the Internet. The players become Zen Buddhists, make their own gardens by collecting panels with sand ripples and stones, and compete its beauty. The points they get will differ by the panels with mosses and the types of the stones. 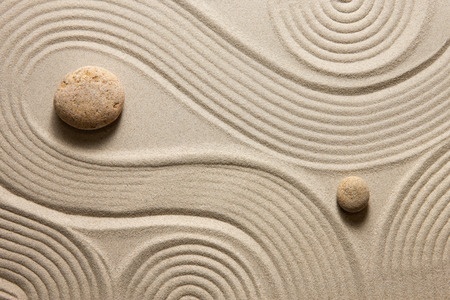 There are detailed rules, like if the sand ripples express a beautiful swirl, points are added, and if the patterns of the sand do not match with the panel next to it, points are subtracted. Also, if you place the stones as they are mentioned in the card of the best gardens that you receive at the beginning of the game, you get points added, and you can pool “Toku (goodness) points” to get stones. It is a game requiring thinking skills, so adults might get carried away. This futuristic idea of putting together Karesansui, a traditional Japanese culture, and a game that is something to play with, spread its popularity through the SNS. In the future, there is a possibility that more people would get interested in Karesansui from playing this game.